04-11-17 00:00 Happy Easter with TopLop.com! Dear Friends! We are happy to celebrate 10th Easter this year with You! This is a special year for all of us! Also this year is unique, because Orthodox and Catholic Easter will be celebrated on one day – April’16! Easter eggs, bunnies, baskets and candy have become a standard part of this holy holiday. 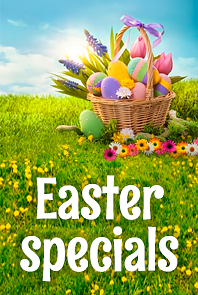 We’ve prepared New Delivery Propositions that will help you to create a special Easter mood for your Beloved Lady from TopLop.com! Just choose the best gift and it will be delivered to Her in5 days! You'll be able to enjoy the photos of your sweet lady taken at the delivery moment. Dear Friends, we send you and your family our best wishes and we do hope this Easter will be unforgettable and will bring a lot of tenderness, love and light into your lives.